Noumea is the capital and largest city in New Caledonia and has a total population of roughly 100,000 inhabitants. The city is located in the southwest of the country on a peninsula on the main island Grande Terre. It forms the administrative, cultural, economical and industrial centre of the country and most people arriving by plane will eventually spend a day or so in lively and ethnically mixed Noumea. It has good facilities, with hotels, restaurants and transport to suit all budgets, but it lacks charm in general. The Parc Fosestier, close to Noumea, makes for a great value (400 Francs for adults, September 2011) day out. The park is served by the Noumea Explorer bus, but otherwise not by public city bus. It is possible to take a taxi there also. The park is home to indigenous flora and fauna of New Caledonia and the region. There are numerous picnic areas in the park. There is a vending machine selling a limited number of items at the entrance gate. But why not bring a picnic and enjoy a break from the sunshine under the cover of trees. Musee de la Ville de Noumea - the City Museum offers a glimpse into the history of the city since it's founding by the French State in the mid 1860's. There are also displays dealing with the part played by soldiers and volunteers alike in the French armies active in both World Wars. Bastille Day, held on July 14th each year is a national holiday in France and New Caledonia, marked with a military parade, fireworks, music, and dancing. Nouméa holds a carnival mid-August every year, which is one of the islands largest events attended by about 15,000 people. There are concerts, music, costumes, dancing and food and in the early evening, a grand parade moves from Birhakeim Square through the streets to the Jules Ferry Quay where the day ends with a fireworks display. Christmas celebrations take place throughout December in New Caledonia with several markets, light shows, trees, children’s activities and, in Nouméa, a Santa’s post office in the Place des Cocotiers. Christmas Day is a time for family meals and gift-giving. Many restaurants will have a special menu for Christmas Eve, often featuring local specialties such as crayfish. Although Noumea has a rather warm and humid climate, it is not as hot as places further north in the Pacific. The warmer period is from October to May, with temperatures around 26° C to 28 °C on average during the day and around 20 °C at night. Rain is common throughout the year. The driest period of the year is from September to December, while January to June is a wetter period. Even then, rainfall is not high - March is the wettest month and only gets around 140 mm of rain. Between June to August, the nights are relatively cool, but it rarely gets cold. Tontouta International Airport is located some 45 kilometers from Nouméa. The national carrier is Air Calin, which mainly serves destinations throughout the Pacific region, Asia and New Zealand. Destinations include Auckland, Bangkok-Suvarnabhumi, Brisbane, Hong Kong, Honolulu, Guam, Kuala Lumpur, Manila, Melbourne, Nadi, Osaka-Kansai, Papeete, Port Vila, Seoul-Incheon, Singapore, Sydney and Tokyo-Narita. Other airlines serving Noumea are Air Vanuatu, Qantas and Air New Zealand. All three have connections from several cities in Vanuatu, Australia and New Zealand. Air Calédonie provides domestic services between Nouméa and Touho, Koné, Koumac and Belep, all on the main island, Grande Terre. Other destinations include outer islands like Ile des Pins and the Loyalty Islands: Maré, Ouvéa, Lifou and Tiga. Air Alize, Air Loyaute and Helicocean and Helitourisme have light aircraft and helicopter services, some of them chartered. There is an inter-island, high-speed catamaran, ‘Betico’, which runs regularly to Ile des Pins and the Loyalty Islands from Nouméa. There is a comprehensive airconditioned public bus service that serves Noumea. Some services end in the early evening, bus stops generally have timetables on their pillar. Many services pass through or near to Place des Cocotiers, the main square of Noumea. The centre of the city is quite compact and walkable. It is possible to rent a bicycle from a store in the Gare Maritime complex on the sea front. The centre of Noumea is flat, but you do meet some hills as you leave city heading inland. Internet cafes are common in the capital Noumea, with prices reasonable. Many hotels offer wi fi and or internet services. The OPT post offices are available in Noumea. 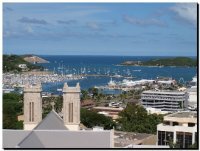 We have a comprehensive list of accommodation in Noumea searchable right here on Travellerspoint. You can use our map to quickly compare budget, mid-range or top of the range accommodation in Noumea and areas nearby. This is version 13. Last edited at 12:21 on Aug 30, 18 by Utrecht. 7 articles link to this page.